The seats of spirits or deities is known as Sanas or Sthanas. All the Sanas are more or les similar in appearance and construction having a common architecture style. The shrine for the deity is a small masonry structure with a single chamber inside and a narrow circumambulatory passage all around it, the whole surrounded by high wooden railing forming the outer wall of the shrine and roofed over by copper sheets or tiles. In North Malabar these shrines of smaller deities are called ‘Tharai Mundya’ (Bushes), ‘Kavu’ (Grove), ‘Arai’ (Room), and ‘Kottam’. 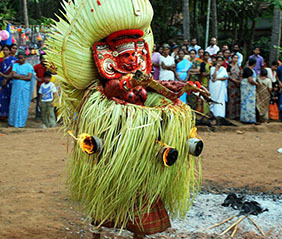 When Theyyatam is performed in a place where there is no permanent Sthanam of deity, a emporary thatched cottage or Arai is made for the purpose. In many of these shrines no image or idol of the deity is available. Sword, Spear and Peetam ( the heavy ceremonial wooden stool covered over by red silk cloth) are placed inside the shrines as symbols of the deity. No daily worship or offering is performed in these shrines.